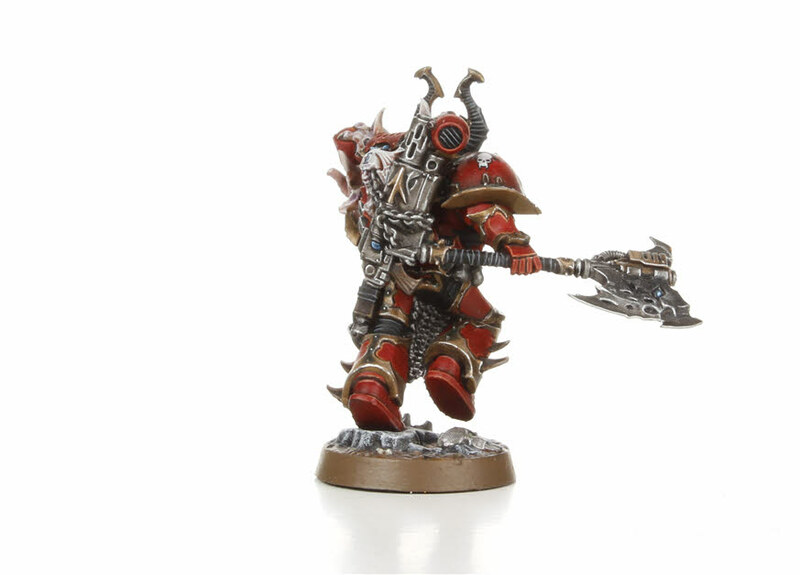 Following on from my review of Codex Chaos Space Marines I thought I’d take a look at the new plastic multipart Chaos Space Marine Aspiring Champion. When the images were first leaked on the interwebs this was the model that first sowed the seed of damnation because, quite simply, he looks like an absolute beast. I mean this dude is massive. Between the pose, the horns and the base he actually stands taller than the Dark Vengeance Chaos Lord. Which is kinda awesome. 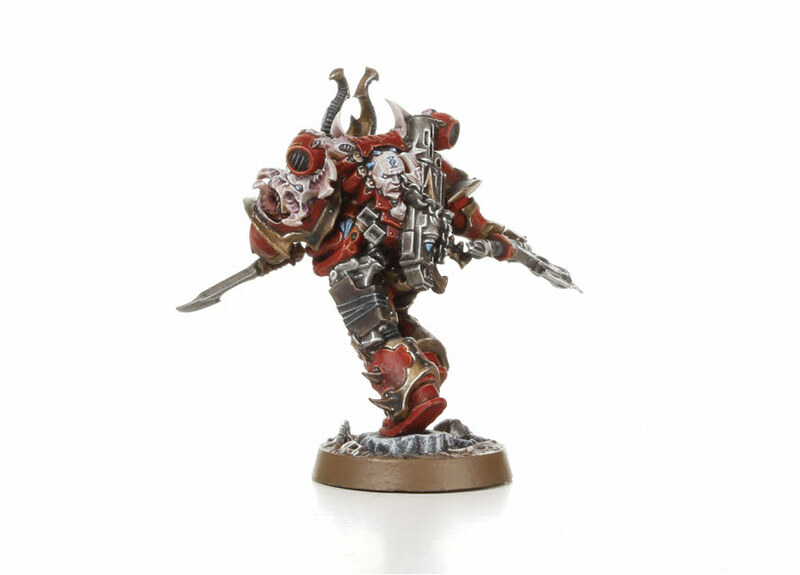 The other great thing about the model is that it fits in perfectly either a standard unit of Chaos Space Marines or in a unit of Chosen, which I’ll be doing for my Dark Knights. In truth he’s chunky and cool enough to be a Lord model which is just as well because compared to the new models coming out the existing HQ models are a little poor. Aside from his rather hench stature, the Aspiring Champion is dripping with detail. 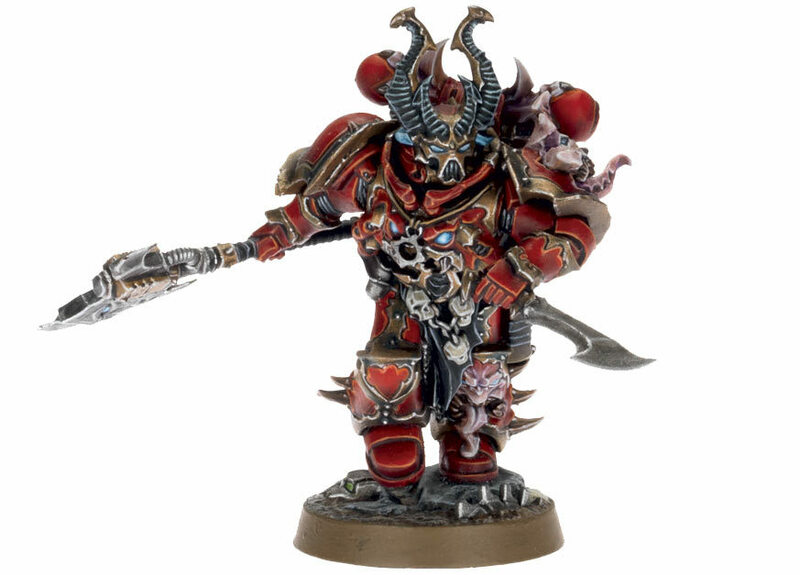 One of the really exciting changes with the new Chaos stuff is that the models aren’t just covered in spikes but now everything feels much more organic and the spikes that are there look like they’ve grown out of the armour. Which is the point and something I’ve been banging on about for a while. Those further down the path of damnation will have heavily mutated armour than those that have recently turned from the light of the Emperor. The Aspiring Champion has faces leering from its armour, slathering tongues and all, which is way cool. The chest plate is really well done with just the hint of daemonic menace lurking within but a different paint job and it can be ambient lights or even gem stones for the Slanneshi players out there. The studio painted model with for pink faces on the leg and shoulder which I’m not massively keen on but obviously that’s purely a preference thing. Even the backpack is twisted with arms holding the exhaust vents and what looks suspiciously like the head of an Inquisitor embedded in there too. Which is awesome. Aside from the absolutely brilliant helmet my favourite bit is the power axe. Aside from being massive it, like the armour, is as twisted and sinister as the rest of the model. It’s not just a weapon but an extension of the model which is a very important design graduation compared to something like the Chaos Terminators who just have, basically, spiky weapons. In terms of the kit it’s an absolute dream to build. I’ve been quite a critic of the new plastic character packs because of the price, but that’s more Games Workshop’s laughable pricing structure, the quality of this model in terms of casting quality and detail is absolutely awesome. There wasn’t a mould line in sight and it just slotted together utterly effortlessly and has completely converted me. And it’s superior to Finecast characters because it’s properly laid out rather than metal models being made with resin. As much as I hate to admit it I wouldn’t think twice handing over the asking price for the Aspiring Champion because he is, top to bottom, awesome. I can only hope the Games Workshop release a couple more to allow for some variety across the army. I’m looking at picking him up, but I am a massive fan of their plastic characters have 2 of them and they go together great. Pingback: Will the Dark Vengeance Limited Edition Interrogator Chaplain Return?